This fabulous recipe for Sweet BBQ Crockpot Ribs uses just three ingredients. A cola beverage, or pop, as we call it in the Midwest, adds a wonderful sweet note and tang to the recipe. Combine it with barbecue sauce, thyme leaves, and ribs in the slow cooker in a two-step process for a great barbecue taste even in the middle of winter. The cola also helps tenderize the ribs. The acid in the beverage helps denature some of the proteins so the ribs are very tender, with a little spice. Then, when the ribs are done, the liquid is drained off the meat and the ribs are glazed right in the crockpot, with barbecue sauce. The pork loin back ribs called for in this recipe are also called baby back ribs. 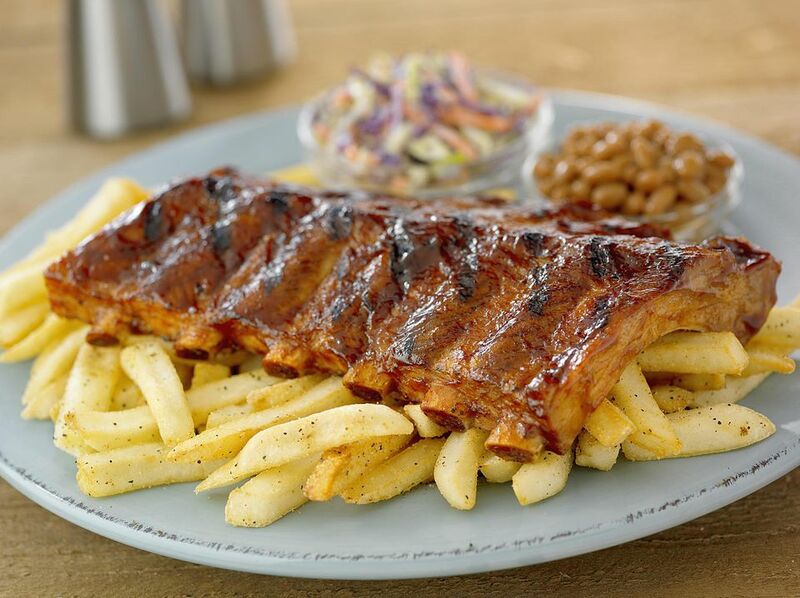 They are called "baby back ribs" because they are shorter than spareribs. This cut of pork is taken from just under the back fat, above the loin. The ribs are very tender and lean to start with, and in the crockpot they become meltingly tender. You can substitute country-style ribs for the pork loin back ribs called for in this recipe; those are meatier and more like a pork chop. Or use spareribs but have the butcher cut them in half so they fit into the crockpot. With these ribs, you should serve some type of coleslaw, potato salad, and some beer or ice cold sparkling water or pop. And lots of napkins! Ribs should be eaten with the fingers; that's part of the fun. For a really elegant touch, provide heated and damp hand towels for your guests to clean their fingers after (or during) eating. Run hand towels under very hot water, squeeze them out, and place in foil. The towels will stay warm until your guests want to use them. Spray a 4 quart slow cooker with nonstick cooking spray. Cut the ribs into 2 or 3 rib portions and place in prepared slow cooker. Sprinkle the ribs with salt and pepper and pour cola over all. Cover the crockpot and cook on low for 8-9 hours until the ribs are tender and at least 170°F. Drain the liquid from the slow cooker and discard. Pour the barbecue sauce and thyme into the crockpot on top of the drained ribs and mix so the ribs are coated. Cover the crockpot and cook on low for 1-2 hours until ribs are glazed.